So many fruits! So little time! With so many bizarre and colourful options to choose from, it can be rather intimidating. Luckily, we’ve complied for you a great big guide to fruit to spot out during your travel in Vietnam! One visit to a market in Vietnam makes one thing clear – Vietnamese people are serious about their fruit. With dozens of types of fruit harvested at various seasons throughout the year, early morning food markets and grocery store produce aisles are subject to a carousel of colors and aromas. Enjoying the food in Vietnam goes beyond just trying the options at pho stalls and rice shops – mid-day snacks and desserts are just as important in getting a real taste of authentic Vietnamese flavor. But where to start? With so many exotic fruits growing almost exclusively in Southeast Asia and Vietnam, getting a handle of what to try (and where to find it) is almost as complicated as navigating the traffic or speaking the language. Thankfully, with a little bit of know-how and some basic pointers on what to look for, anyone can get a lesson in Vietnamese food culture next time they head to a local market. These are just some of our favorite fruity flavors that are famous in Vietnam – and the best ways to try them. This close cousin to the lemon might look nightmarish, but in Vietnam the fingered citrus has strong spiritual connections. Phat thu is rarely eaten, and is usually found in temples and pagodas or on ancestral shrines in local homes instead. Its strangely decorative utility comes from not its taste, but rather its appearance. When compared to the iconic hand of Buddha, it looks remarkably similar, and thus has taken on particularly religious significance. When used in a home, its appearance takes on even more importance – the number of “fingers” on this fruit is directly proportional to a family’s luck. Consequently, most look for fruits with as many fingers as possible to put in their homes. Phat thu is harder to find than other fruits in Vietnam given that it’s not regularly eaten. Traveling sellers on bicycles and at some small morning markets are some of the only places to find it. Generally phat thu is reserved for decoration, and not eating. But some culinary gurus have managed to find unique and tasty ways to include it in your diet, with plenty of fun recipes online if you want to try your own hand at it. Out of the many strange fruits native to Southeast Asia, dragon fruit is probably the most recognizable. It’s for good reason, since dragon fruit is easily the most beautiful fruit, usually a combination of vivid pink, black and white. Strangely, the fruit’s taste doesn’t match its appearance, and is relatively tasteless and not particularly sweet. Dragon fruit, like phat thu, is popular to use in pagodas and on ancestral altars, but is regularly eaten, too. Plenty of restaurants use it to make fruit salads, and you’ll often find it cut into even pieces on plates and presented after meals in local houses. Dragon fruit is especially popular, and is easily found at plenty of markets. Given high demand, its available year round, too! Dragon fruit’s mild flavor and tasty consistency makes it a perfect summer treat on its own, or after a meal. Cut it into slices like watermelon to eat it by hand, or add it to a salad to give it a tart kick. Just like the dragon fruit, the rambutan is almost more fun looking at than eating. Covered with a bright red skin that looks strangely hairy, rambutan is a native to the Indonesian Archipelago, and its Vietnamese name chom chom is a local way of describing “messy hair”, thanks to its unkempt appearance. Similar to lychee and langsat, rambutan is harvested while still connected to the branch, so buying a handful of them means having to pull them off of the branches. Rambutans are harvested mainly in the summer months, so they’re a popular addition to sweet desserts like che or eaten fresh off the branch. Rambutan yields usually start around the beginning of the rainy season in the southern region of Vietnam, and start popping up at street markets around June and July. It’s biggest yields come from Binh Hoa Phuoc village and Long Ho District, about 50 kilometers from Ho Chi Minh City. Rambutan is usually served unpeeled or partially peeled, and each had a inedible pit that is discarded while eating. Most locals slice the rind down the middle carefully with fingernails or a knife, pulling off one hemisphere of the peel while holding the other to keep hands from getting sticky. These usually come in a plastic bag from the market, so use this to discard pits to avoid littering. Lychees are a particular favorite in Vietnam, and one of the most popular snacks to have between meals (or after them). Like longans and rambutans, they regularly play a starring role in che and desserts, and are even popular at some of Vietnam’s new wave of frozen yoghurt shops. The flavor is so famous, in fact, that there are teas, fruit juices and ice creams with lychee flavor – a mild and slightly tangy sweet taste – and they’re easily found in grocery stores, some corner shops and most markets. Plus, there are plenty of varieties that are grown in Vietnam, so you can find new ones to try nearly every season of the year. Ever popular in Vietnam, you’ll find lychees nearly everywhere, but the most popular variety, “vai thieu”, ripen around May and June. Some varieties are available earlier in late April, and nearly all of the yields grown in the country are sent to local Vietnamese markets , so they’re easy to find for the summer. Like its fruity cousins, a cut across the middle is the best way to get to the yummy center of lychees. Their shells are a bit tougher than rambutans, though, so spare the nails by using a knife. Longans are similar in size and taste to the lychee and rambutan, and just like them, are a main ingredient in Vietnam’s iconic summer treat, che. The clear white pulp is rich with protein, and is harvested by cutting the branch, and not pulling the fruit away from it. Consequently, when buying them in a market, you’ll usually be given a handful that’s tied together by the branch, and charged by the weight. These are great treats to eat fresh off the branch, but their taste is best when mixed with lotus seeds and other fruits in che. Just like rambutans, lychees are usually eaten right off the branch, and need to be peeled. A slice around the circumference of the peel with a fingernail or knife is best practice, and keep things from getting too sticky. Not to be confused with grapefruit (which historically was called pomelo), pomelo is one of Vietnam’s most popular fruits to eat fresh. When peeled, the super sweet fruit looks a bit like an overgrown orange, but isn’t usually as sour as other citrus. 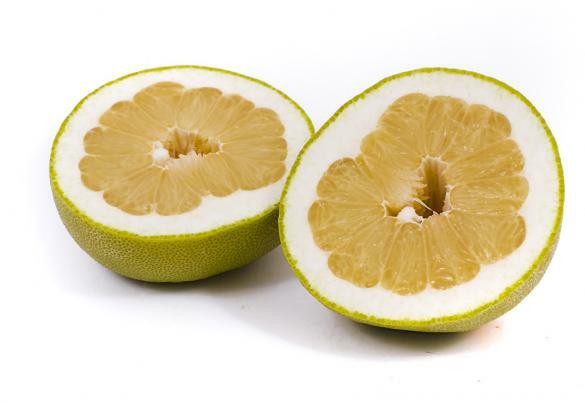 Pomelo is popular on salads rather than deserts like che, but is most often eaten fresh. A favorite addition in Vietnam, though, is a dipping “salt” called bot muoi ot, which is both salty and spicy and has a distinct flavor when combined with pomelo. When buying pomelo (along with plenty of other fruits), you’ll be given a tiny bag of bot muoi ot, but be careful how much you use. It can be surprisingly spicy! Pomelo is sold both unpeeled in street markets and peeled in many supermarkets. Be prepared for some serious elbow grease if you buy it unpeeled – its rind is exceptionally thick, and sometimes requires more than just hands. If you’d prefer to dig into pomelo quickly, you can find them already sliced and peeled in supermarkets, ready with some spicy salt on the side. But for more adventurous eaters, they can be peeled like a grapefruit with the help of a knife. Even better, locals use pomelo to make nom buoi, a sweet salad, by mixing it with seafood or dried beef jerky, and drizzled with fish sauce and lemon dressing. Mangosteen is one of the tastiest of Southeast Asian fruit varieties, and its especially popular in Vietnam. Covered with a dark red rind that has the tendency to stain your fingers when peeling it, mangosteen’s super-tangy white fruit is slightly fibrous and very juicy. Usually eaten fresh, mangosteen is sometimes used in many different kinds of sauces and as a popular ingredient to amp up certain savory foods. Given restrictions on imports and exports of mangosteen, its exceptionally rare in the produce aisles of North America, which make them a must-try when visiting Vietnam. Mangosteens are especially popular, so they’re easy to find in major grocery stores as well as street markets when they’re in season. Unfortunately, the mangosteen season is very short, usually only lasting six to ten weeks on average, (usually around May to August). Mangosteens are very juicy, and eating them without a bit of a sticky mess is near impossible. Their rinds are tougher than other fruits, so you’ll probably need a knife to peel them, but be careful while you slice. Too deep, and you’ll puncture the fruit and lose all the tasty juices! Jackfruit looks similar to durian on the outside, but has a much more pleasant smell and taste on the inside. Native to Southeast Asia, jackfruit is the largest of tree-borne fruits, and smells sweeter and fruitier than durian. Its sticky, gooey fruit is similar in texture, though, and high in dietary fiber. It comes in two varieties, one being a softer and more buttery consistency, and the other (popular mostly in Indochina) is crunchier and drier. Both are readily available throughout Vietnam, and they’re popular to eat fresh peeled. Jackfruit grows in considerable amounts around Vietnam and Southeast Asia in general, so it’s usually easy to find them at street markets. For something uniquely Vietnamese, try jackfruit che, which combines the fruit with ice, beans and glutinous rice. Jackfruit, like durian, is slimy, and should be peeled carefully to avoid ruining the experience. Part of the fun of jackfruit though is getting your hands a bit dirty, so after cracking one open (you’ll need some heavier machinery than your hands!) dig in, and keep a cloth to wipe your hands handy! 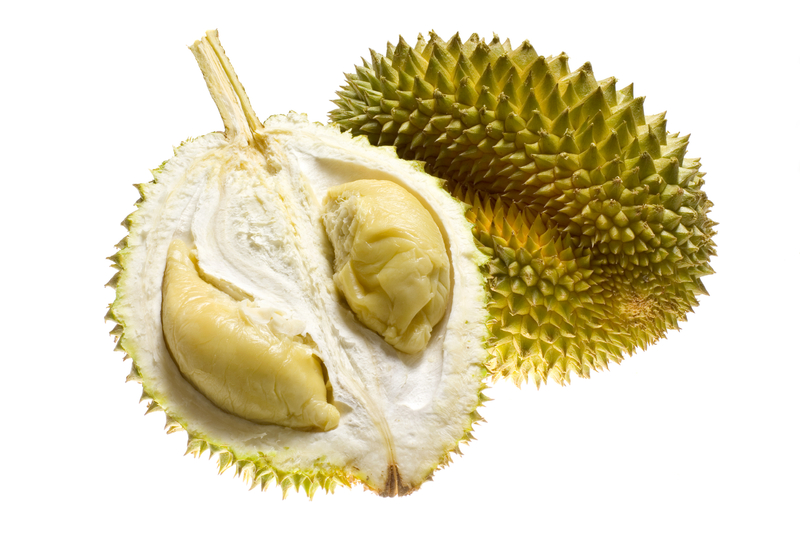 Durian is equal parts loved and despised in most of Southeast Asia, and its distinctive smell is why. Some relate its aroma as something akin to gasoline, and its so putrid that walking past a shop selling durian usually has you crossing the street. Despite its smell, durian is a very popular fruit in Vietnam, with many enjoying its strangely gooey fruit freshly peeled. Durian certainly isn’t for everyone, though, with many opting for durian flavored ice creams and yoghurts rather than the real thing. Durian is sold in plenty of shops along the road, as well as street markets. They can be difficult to find in some supermarkets given their smell, but a quick stroll down the road with your eyes – or nose – peeled will lead you straight to where they’re sold. Eating durian in a public space can be a bit of a faux pas given its incredibly pungent smell, so this one is best kept at home. Just like jackfruit, it’s very slimy, so keep a cloth ready for clean up. Bitter gourd, or bitter melon, is one of the most iconic ingredients in Vietnamese food. Rarely eaten fresh, bitter melon is a popular addition to soups or rice, often stuffed with pork or beef. Its name comes from its incredibly bitter taste, which is avoided by literally every other animal besides humans. Its importance in Vietnam is illustrated by the existence of a National Bitter Melon Association, which makes somewhat strange but truly charming connections between bitter melon’s taste and the trials and tribulations of life. While eating in Vietnam, it’s nearly impossible to avoid trying bitter melon at one point or another. Try it in a soup or mixed with pork, but avoid having it fresh unless you’re daring. There’s almost no reason to eat bitter melon raw, and for those that do, they usually regret it. That said, bitter melon tastes great in a soup, so keep an eye out for its cooked version at food stalls to get a taste. Most of these fruits are popular in other parts of Southeast Asia as well, but can have slightly different harvesting times depending on your location. Ask shopkeeps or locals when they’re in season in the countries you’re in to enjoy them everywhere you go!